Standard Room - While the decor enhances the local rustic charm with patchwork cushions and kishangarh stonework; the room (270 Sq.ft) is supplemented with all modern day amenities like the mini bar, air-conditioning, laundry. Deluxe Room - The highlight of the deluxe room (300 Sq.ft) is the view of the vardant gardens and the Aravallis. 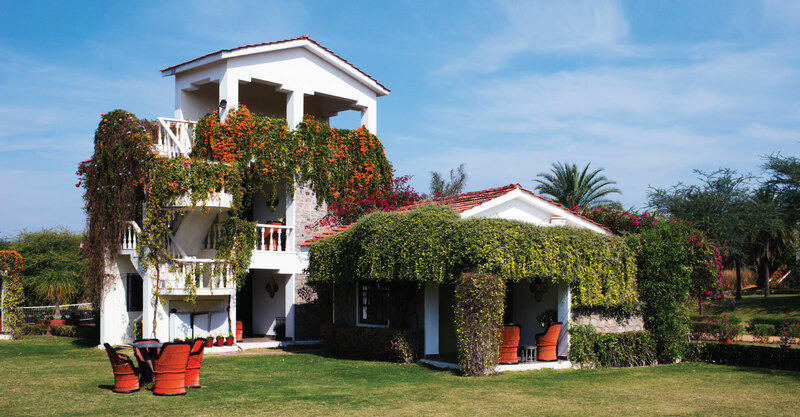 With earthy interiors to match the moods of Pushkar, along with all the basis modern day amenities, the room also offers beautiful private sit out areas surrounded by flowering plants and creepers. Superior Room - Bright green and orange walls characterize the superior rooms (325 Sq.ft). Inspired by the vibrant Rajasthan colours, the interiors re-create the essence of local flavours by using local handicrafts for the decor. The additional baithak area is a special feature of the superior rooms.